Consider that Coffee doubled into 2011, due to huge supply shortages as Brazil only produced 1.9 million tonnes as opposed to almost 3 million they normally would do (my younger brother works in the Coffee industry by supplying Arabica roasted via his own business to merchants). Now that supplies have come back on stream, Coffee have reversed that spike from last year and is down a lot, currently trading around $1.55 per pound. Yes, hedge funds are extremely bearish, so naturally as contrarian I’m very bullish on Coffee (and all Softs), but I don’t see any major upside straight away. This is a longer term investment, because after such a huge sell off, usually prices tend to bottom and base for awhile. You normally don’t get a spike after a spike just occurred last year. At least I am failing to see it happen before and I got a 120 year chart of Coffee in front of me right now. The last double spike was in 1994 and in 1997. 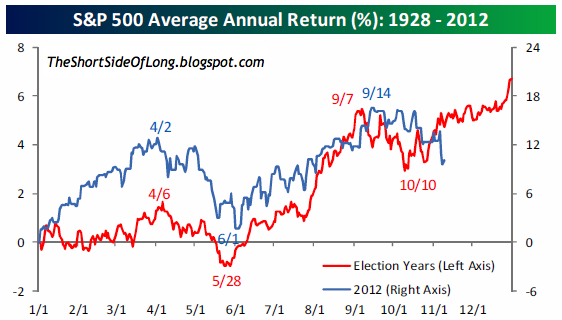 It takes at least a few years of basing before the rally continues in my opinion. At the same time, Copper is confirming this too, by reversing all of the Fed QE3 gains out of September. We are back to $3.45 and Copper bulls got too optimistic too quickly. Korean KOSPI, barometer of global industrial activity and correlated highly to China, is looking rather weak in my opinion as it decided which way it will go in a triangle. I assume we will eventually break down. I rather believe Copper prices or price of KOPSI, than Chinese statistics published around the time of Communist leadership change. Honestly… who actually believes China is growing at 7% and IP is at 9.6%? Are you serious? I don’t believe in fairy tales or bed time stories, but I use to when I was a kid. market guy 15 – I’ve never seen Bespoke publish anything bearish either, I am a subscriber. They are as perma bull as it can get. 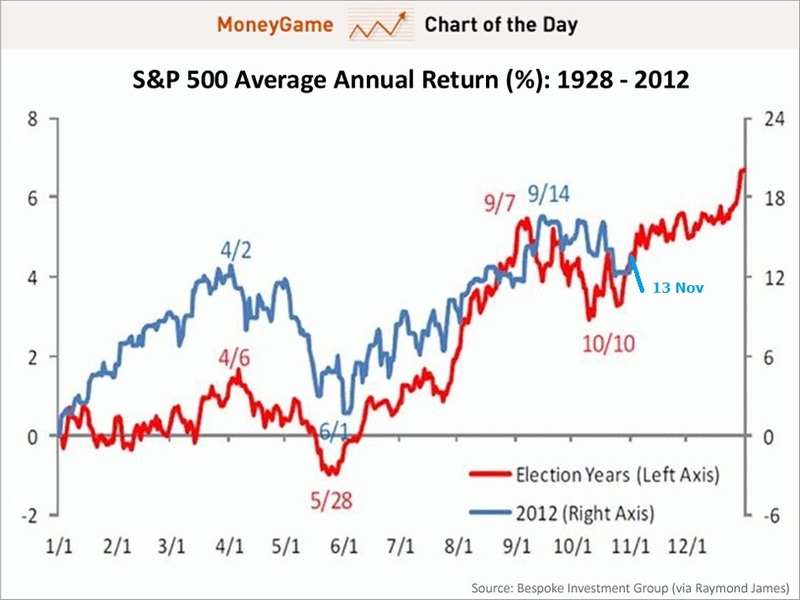 Obviously in works in a bull market, but when the bull market ends… boy oh boy did they get hurt in 2008! That’s interesting guys. I’ve always found Bespoke to be a reliable purveyor of stats and facts rather than bias. Are you saying they only publish bullish-leaning findings? I used to follow them quite a bit but they always see the world through bull colored glasses…imo anyhow….they sometimes post interesting factoids but they always seem to be bullish (especially in declining mkts). Picking names here: I like Intel at these levels. Big company, global, and they produce something of value… well sorta. Valuations seem fair, some cheap relative to tech space so I am a buyer. I do not like Louisiana Pacific ($LPX). This company’s +165% price appreciation in 3 years is all well and fine but considering how this company has a negative ROE, margins are negative, revenues and earnings are down past 5 years, and the list goes on, it simply is overvalued. This is where sentiment leads fundamentals. Either fundies catch up and sentiment releases they are ahead of the true “growth”. Do not like First Majestic Silver ($AG) either, relative to the price of silver. Hedging play there. Equities (broad) and bonds are hated by me alike. Stocks (in general) are overvalued and the bond market is in a clear bubble via the Federal Reserve. This we all know. Pick ’em wisely. I’m just picking up things I see along the way for the mean time. Chart below is one of my favorites: INTC to AG ratio. Yes, these companies have NOTHING in common (well, maybe a little), however a chart is a chart regardless of the ticker symbol. Blue line is the $SPX. I agree fully here John. $USHL5 says the market can go a bit lower before a rally. However, there is no positive divergence yet. $USHL5 gave its power buy signal (based on positive divergence to price) back in May-June 2012 and Aug-Oct 2011. I am patiently waiting. A failed rally today does not help the bull case. I remember you were buying Intel several weeks ago. Are you still long Intel Edwin? I notice it broke down even lower last few days. Bullish sentiment of newsletter writers dropped to its lowest level since June. Bearish sentiment rose to highest level since Feb.
I’m no technical guru and I cannot quote various impressive buy / sell signals every couple of days, but from a basic and simple observation, I have noticed that the VIX is now in a pressure cooker between 50 MA and 200 MA. It seems there could be a major burst in either direction soon and it’s decision time.